Repeating from a previous post. This happens TOMORROW (Sunday)! Please help us spread the message concerning the growing issue of gun violence in the Unites States, including gun suicides and domestic violence involving guns. 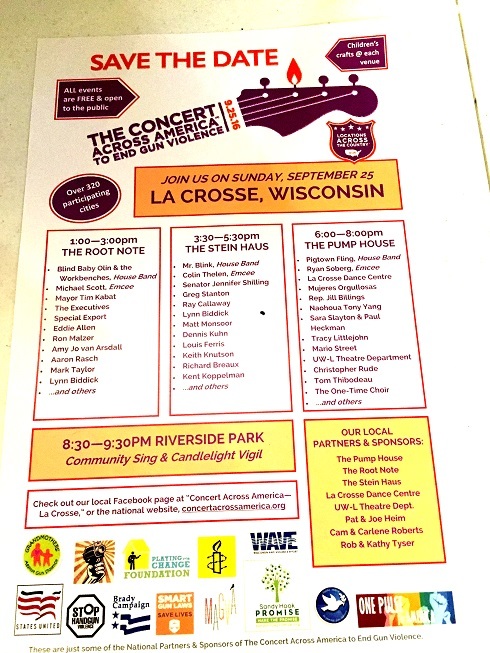 The La Crosse coordinators, led by Anne Drecktrah, Susan Fox and Diane Breeser, have planned a variety of events at four different venues. The line-up includes local bands Blind Baby Olin and the Workbences, Mr. Blink, and Pig Town Fling, musicians Dennis Kuhn, Chris Rude, Special Export, Matt Monsoor, rapper Guess Prefontaine and The 5th Chamber Quintet. Also performing are the La Crosse Dance Centre, Mujeres Orgullosas, UW-L Theater Department (performing a scene from the world premiere of “26 Pebbles” a play about the Sandy Hook shootings) and local storytellers. There will also be a children’s area at each venue. Guest speakers/readers include members of law enforcement, the LGBTQ community, Naohoua Tony Yang, Tracy Littlejohn, Shaundel Spivey, State Senator Jennifer Schilling, Keith Knutson, Mark Taylor, Sister Julie Walsh and others. La Crosse Mayor Tim Kabat will also offer an opening welcome and statement. There is a local flyer, but no one can open the file!. Please, I beg you! If you have MS Publisher on your computer, take it off immediately or burn that computer. Do not use publisher! Do not give people publisher files. They can't open them!!!! If you must use publisher, print the final product as a .pdf. Please! You’re invited to participate in a live chat room discussion during the Presidential Debate Monday night! Join me and your fellow progressives in a real-time, active discussion about what the candidates are really saying, why they are saying it, what we can use, and how we can re-frame to help forward progressive policies in our communities (http://www.frame4future.com/public-forum). Last minute meeting notices are par for the course around here. For some reason, city government does not seem very interested in helping its citizens have a voice. TUESDAY, SEPTEMBER 20, please attend if you can, the city's Capital Improvements Priorities meeting at 4:30 p.m. in City Hall's first floor conference room. 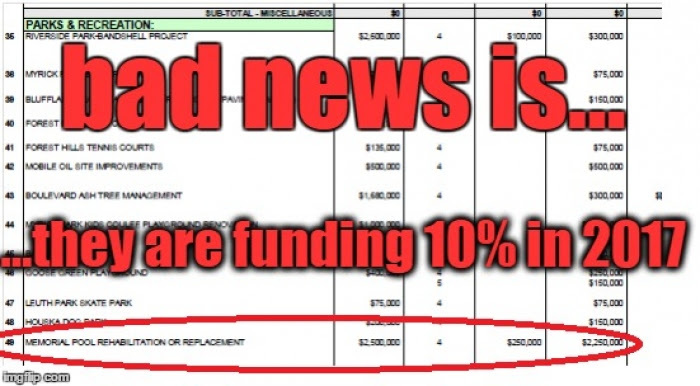 The proposed budget has only 10% of funds needed to fix the pool. This must change. Because of late notice, there's a fear that a smaller contingent of supporters will not have as much impact on the committee. Here's more from the Save Memorial Pool group. Project Update: Save Memorial Pool UPDATE ON MEMORIAL POOL STUDY & PLEASE ATTEND CIP MEETING,@ City Hall-3rd Floor Conference Room AND CONTACT THE MAYOR & CITY COUNCIL. Good news....WE RAISED THE MONEY TO COMPLETE THE $6K PORTION OF THE STUDY!!!! We received many more checks and cash than online, and we just finished counting it up - WE RAISED OVER OUR GOAL!!! Not-so-good...THE MAYOR & CITY DEPARTMENT HEADS BUDGET PROPOSAL ONLY FUNDS 10% in 2017...must be a pretty small pool for $250,000 or maybe it is for Architecture & Engineering only? Given the fact that Memorial Pool has been in the proposed Capital Improvement budget AND REMOVED EVERY YEAR FOR MANY YEARS, this is concerning. What more do we have to do??? Thousands of petition signers...thousands of dollars... tomorrow please attend to make clear at the Budget Meeting: FUND IT COMPLETELY IN 2017!!! Keep in mind, they could still take out the $250k, so we need to make this decision easy to AT LEAST keep in the $250k *OR* FUND IT COMPLETELY for $2.5million (or more). Tomorrow will be a similar format to the last CIP meeting, but given the short notice, I am sure we won't have as many people. Talking points should be focused on the urgency for this year, the value of the investment to aquatics/neighborhood revitalization - say something VERY brief. So, reach out to others who may be able to stop by and encourage people to call their council members for support. In fact, call your council person and the Mayor as well. THIS WILL BE THE LAST CITY MEETING ON THE CAPITAL IMPROVEMENT BUDGET (for which the Pool is eligible) UNTIL NOV. 3RD, SO THIS ONE IS KEY!!! Congratulations on the fundraising effort...lets keep making it worth everyone's time and money!!! Donate to save Memorial Pool! The Save Memorial Pool folks are seeking small donations to help with their campaign to ensure this important reminder of our progressive past is not turned into a parking lot. Memorial pool is a legacy, a message from our ancestors that even when money is tight it is important to invest in the future. The last update from this group of active citizens noted that they are trying to raise $4,000 to help with future actions and plans. Now, you can DONATE ONLINE (through 9/19)! 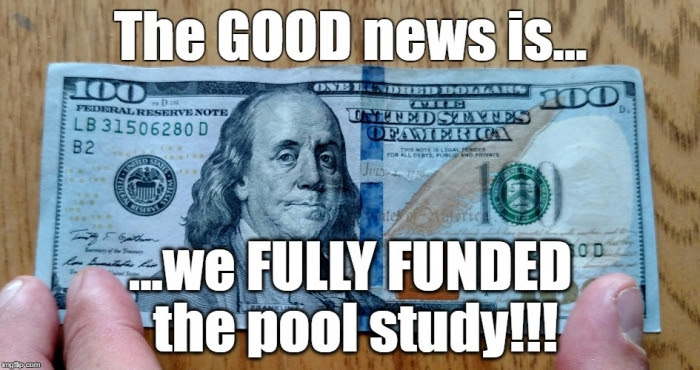 LAST CHANCE - DONATE NOW TO SAVE MEMORIAL POOL STUDY! Sep 16, 2016 — Only A FEW DAYS LEFT for our fundraiser - PLEASE HELP TODAY! Here's a mix of news you might find interesting. For a daily does of interesting news, please consider subscribing to The Daily Call. SNOWDEN We attended a sneak peak preview of the new Oliver Stone film last night. After the film, Stone, Snowden, and the two lead actors (Joseph Gordon-Levitt and Shailene Woodley) discussed the film and some of the issues. Snowden has said this is a pretty realistic depiction of what happened. We recommend the film. These issues are still with us. It's showing in La Crosse at the Marcus Theater on Ward Avenue. (You may also be interested in the 2014 HBO documentary, Citizen Four, streaming online). A new effort to get a pardon for Snowden before Obama leaves office is taking off now (and includes Bernie Sanders). Meanwhile, Green Party presidential candidate Jill Stein says she will immediately pardon Snowden if elected. Meanwhile, back in North Dakota, the "police" are arresting journalists now and the truck of supplies and donations for the Standing Rock Proctectors is leaving La Crosse Ho-Chunk Three Rivers House on Friday. Always the optimist, the always great Chris Hedges describes how, after all the sound and fury of the Sanders "revolution," we are still squarely trapped in the corporate elites' maze. "The multibillion-dollar extravaganza of our electoral Circus Maximus is part of the smokescreen that covers the ongoing devastation of globalization, deindustrialization, trade deals such as the Trans-Pacific Partnership, endless war, climate change and the intrusion into every corner of our lives by the security and surveillance state. Our democracy is dead. Clinton and Donald Trump do not have the power or the interest to revive it. They kneel before the war machine, which consumes trillions of dollars to wage futile wars and bankroll a bloated military. To defy the fortress state is political suicide. Politicians are courtiers to Wall Street. The candidates mouth the clichés of justice, improvements in income equality and democratic choice, but it is a cynical game. Once it is over, the victors will go to Washington to work with the lobbyists and financial elites to carry out the real business of ruling." John Atcheson says this election kabuki theater is the result of the "Oligarchy [being] hoisted by its own petard. "In short, here’s what the three studies tell us: The Oligarchy has run a silent coup and now controls the country – including both parties; they’ve used their power to feather their own nest; and Americans realize it, and they rightfully resent it." Somehow we have ended up in a dystopian parody of a reverso world somewhere between the George Orwell's 1984 and The Matrix. Now what? 7. Call North Dakota Gov. Jack Dalrymple at (701) 328-2200 to demand protections for protestors and and end to hosilitites against them. 8. Call the White House at (202) 456-1111 or (202) 456-1414. Tell President Obama to rescind the Army Corps of Engineers’ Permit for the Dakota Access Pipeline. If you'd like to get involved with the call to show solidarity with the No DAPL Protectors in North Dakota (and Iowa) on September 13 and through the month, please consider donating to the support effort planned by Bronson Koenig and his brother, Miles. Two separate citizen action events are happening right now. Please consider how you can be involved. UPDATE: DAPL Standing Rock protectors will be at the event on Saturday from 10 am until 3:00 pm The event is at Unity Park which is on the lake behind Winona Health. The Protectors will have information about how others can help. at this event about how people in our area can help and support their work. In the meantime, donations can be made through the Standing Rock Souix Tribe's website. There is also a PayPal donation site. Tribal governments from throughout the Americas have sent representatives and aid. If you have any doubt that we are living in a managed information world, note that hardly a word has been uttered (ok - yes, Lawrence O'Donnell on MSNBC but just about nothing on "news" programs) about this very important struggle for rights of Native American sovereign governments and people, protection of the environment, the future of our climate-changing world, and more on any of the main media "news" programs. There was one very brief segment a couple of weeks ago mostly from the point of view of law enforcement. No mention of desecration of Native American burial grounds, lack of oversight by government agencies charged with providing oversight, illegal security procedures, or historical context. Why? You need only wait for the first commercial break about "energy voters" brought to you by the American Petroleum Institute. For good coverage of this issue including interviews with the attorneys, elders, historians, scientists, and activists, watch Democracy Now! As we hear more about local activities to support the protectors, we'll update. Neighborhood Announces Study, Campaign & Public Presentation to Revitalize Memorial Pool 9/7/2016 - PRESS – FOR IMMEDIATE RELEASE LA CROSSE, WI – The Grandview-Emerson Neighborhood Association’s (GENA) Save Memorial Pool Committee has been hard at work in recent weeks to revitalize Memorial Pool after over a year of closure. First, they hired a nationally recognized pool consultant, Isaac Sports Group (ISG), to conduct an assessment that would complement the City’s technical evaluation and soon-to-be-approved City Pool Committee. Now, the Save Memorial Pool Committee is reaching out for $4,000 in donations to fund additional steps providing state-of-the-art pool design concepts, improved aquatic programming ideas and additional cost-saving strategies in time to inform 2017 City Budget law makers and staff. Donations can be brought to participating State/Campbell Rd businesses or written-out and mailed to "La Crosse Neighborhoods, Inc. - GENA" RE: Memorial Pool, P.O. Box 1661, La Crosse, WI 54602. In this case, an historic gem and important neighborhood anchor and resource has been allowed to fall into disrepair and was slated to become (probably) another parking lot. However, the people who live, play, and work here decided that's not what they wanted and they have actively taken a role in educating, examining, questioning, planning, and moving forward with actions to save and improve the Memorial Pool. If there were a prize for citizen action, this group should get it. You may know that Oliver Stone has a new movie coming out about Edward Snowden. In advance of the film's release, the film's producers are doing a SNOWDEN LIVE! event in movie theaters - a conversation between director Stone and the subject of the film, Snowden. Here is The Nation magazine on why Obama should pardon Snowden. Here is an article about the film's participation in this year's Comic Con.